A fiery, muscular ball of raging death, the barbarian is the toughest frontline fighter of any adventuring group. Quick to anger and slow to calm, he will take on any opponent, no matter the size or reputation. 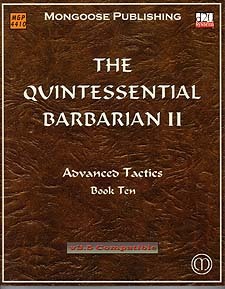 The Quintessential Barbarian II: Advanced Tactics ofers a range of new concepts, skills and equipment to enrich the background and abilites of any mightily thewed hero. With the help of this sourcebook, any character choosing to play a barbarian will find many alternatives and options for expanding his range of abilities. With Career Paths, a barbarian can customise his advancement and gain special benefits from his chosen branch of training. The Legendary Barbarian offers a subset and expansion of his combat prowess that may take him to epic levels and beyond. Multiclassing offers a barbarian a complement to his abilities, while Tricks of the Trade presents new uses for skills and details they mysterious smoke lodge spirit quest. Superior Tools and Barbarian Feats list a host of new weapons, armour types and feats to tempt any warrior. The Fury of Magic contains new magical equipment while The Unfettered Spirit gives a host of alternative rages. Finally, Survival Tactics details the techniques, advantages and disadvantages to portraying a barbarian in your game.